Copperas Cove ISD provides library services to students and staff at all district campuses in a friendly, well equipped learning environment. Each library/learning commons offers an extensive collection of print and multimedia resources, including books, magazines, online reference sources, and computer workstations/laptops for online access and research. All library collections have been specifically selected to support each school's instructional program. 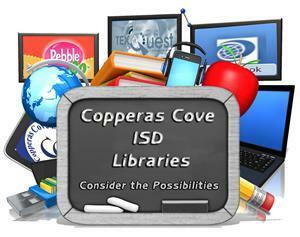 Copperas Cove ISD libraries are an integral part of the school's total instructional program. All students and staff are welcome to use the libraries for academic, curricular, and instructional support, as well as for recreational reading purposes. All certified school librarians are experienced classroom teachers and hold a master's degree. In CCISD all librarians are also members of the Texas Library Association for School Librarians (TASL). School librarians provide support, instruction, and materials to CCISD students, so that they learn to access, evaluate, and use information from a variety of sources.